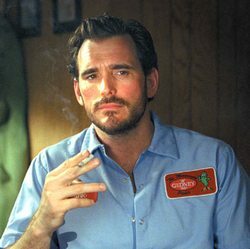 Factotum : "Amazing how grimly we hold on to our misery"
Henry Chinaski (Matt Dillon) : Amazing how grimly we hold on to our misery. The energy we burn fueling our anger. Amazing how one moment we can be snarling like a beast, then, a few moments later, forgetting what or why. Not hours of this, or days, or months or years of this, but decades. Lifetimes completely used up, given over to the pettiest of rancour and hatred. Finally, there's nothing here for Death to take away.